Getting the IRS to move into a new tower built on the surface parking lot on Rivercenter Drive, or into empty space in the existing Rivercenter complex, should be Covington’s first priority. 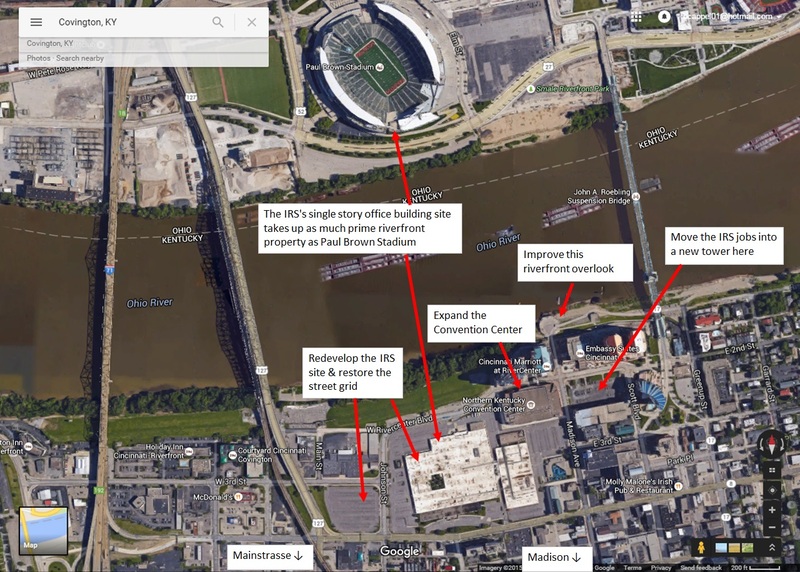 The IRS’s single story sprawling office complex cuts off the newer downtown Covington office buildings, and the Roebling bridge link to Cincinnati, from the historical downtown building stock down Madison Avenue/Pike St., as well as the historic district down Mainstrasse. Redeveloping the IRS site by restoring the street grid into the traditional walkable configuration would help Covington feel whole again. Luxury condo towers with a view could be built, expanding the city’s tax base and easing pressure on the budget. There is also room to expand the convention center, increasing the entire region’s capacity to host events in the urban core. Hotel, apartments, and ground floor restaurant and retail could round out the site to create a vibrant mixed use area.